11/4/2005 1:29:30 PM Mountain jsb:: hey wave 59 guys,,, is wave 59 also a trading platform like tradstation??? 11/4/2005 1:16:06 PM Mountain bls:: Thanks MJS. I too use wave59. 11/4/2005 1:13:42 PM Mountain mjs:: I am using Wave59. You can set up the planets with it to give a tide similiar to Dr Als MoonTides (not the same thing). I set mine up for outer planets and inner planets and for all the planets so I got lots of Planet tides to watch. It is prety good in giving you an idea of turns and possible directions. Still you need trading techniques and disciplin to make it work. A good coach like Dr Al is invaluable while you build up confidence and also to learn new ways to see energy flows etc. 11/4/2005 12:58:18 PM Mountain bls:: MJS: what natal are you referring to? 11/4/2005 12:14:02 PM Mountain mjs:: Hey Dr Al. One of the things to do in Missionary work in Central America is to put in wells. A lot of water for small towns etc. got contaminated by the hurricanes etc. as they were shallow wells. Need to drill down into the deep aquaferres. So hope to link up with folks doing that type of simple stuff that has a long term impact on folks. My job will be financial that is writing up the grant requests etc (same paper pushing I do here but for people to sell mortgage pools) but it has a definite better feel for your life. I also have a request from G. Wash Univ to go to Viet Nam and teach business English my old Commander from Viet Nam is doing that now and got me on their list. So like the Tides there may be some decisions to be made. 11/4/2005 12:07:45 PM Mountain mjs:: My outer planets bottom at 14:35 @ 1217.25 and then run up to EOD at 1220.50. My inner planets turn at 14:53 and also run up. Will look for a good swing for the Monkey to grab a vine on and get another bananna. 11/4/2005 10:46:42 AM Mountain Ben:: Out flat. I'm done. Over trading & can't catch a trend. 11/4/2005 9:59:15 AM Mountain mjs:: MOrtgage people have had me all over US. Lots of activity as rates are changing so lots of portfolio adjustments. Also defaults are picking up and lots of action to send them back per the Warrenty and Reps on the buyer's contracts. Mostly though it will depend on when this Economy finally turns down and the taxi driver and waitresses incomes decline. Merriman has had some interesting projections for 2008 and on. 11/4/2005 9:39:05 AM Mountain Ben:: Nice entry. 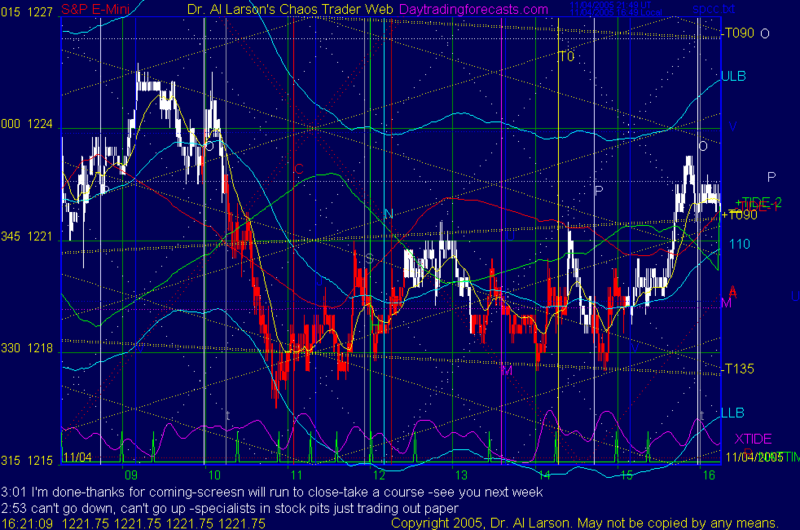 My CTME grid is pointing down for rest of day. Last trade was a counter trend trade for me. How have you been? It's like Henry Ford said : "If you think you can or think you can't, you are right." 11/4/2005 8:19:25 AM Mountain mjs:: Hi Dr AL. I am in Decatur, Al with my friend from Costa Rica getting ready to go down there and work on some Missionary stuff and of course see if we can trade from down there. They have good internet etc. but as you know the Techo stuff is aways a question till you use it. So the big plan is to work more seriously on trading techniques and skills and also the pyscho aspects. My work in mortgageworld up here has kept interferring with these goals but Buying big portfolios has provided the capital to be able to now devote all my time to a "full court press" Your advises etc. are real helpful in viewing and solving some of the problems one encounters in training to be a good trader and using the tools well. But I still hit my thumb with that hammer. Hope your Monkey is helping you I know mine is a big relief to the serious side and can break those brain locks you get when you own head gots off in the wrong direction. 11/4/2005 7:51:52 AM Mountain Al:: Morning, mjs. Got your monkey chattering at me right now.